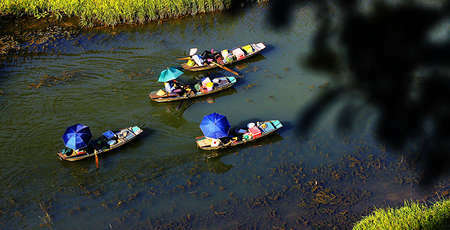 Travel to Hanoi, you will have very practical questions about getting around Hanoi city: What vehicles? How to go and how the cost is? These are the questions of many tourists when they are planning to come to visit the capital of Vietnam. This article will partly give you the information to answer above questions for you. - City bus: this is a public transportation with the cheapest cost. 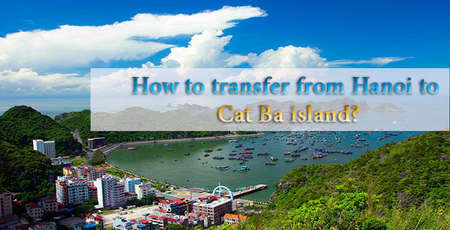 It is about 7000 – 10000 VND (30 – 50 cents) you will have a bus ticket to travel a full one route. The frequency of 10 – 15 minutes/trip, you really travel easily in the city. Bus 09: Route Hoan Kiem Lake. It will take 60 minutes for 1 turn. You will a 60 minute in the bus for city tour with only 30 cents. This bus route starts from 5.00am to 21.00. 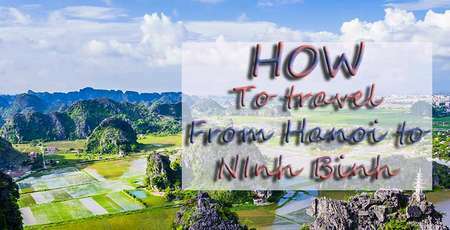 Bus 86: From Hanoi Railway Station to Noi Bai International airport and Vice Versa. It will pass through Hoan Kiem Lake. Time for 1 turn is 70 minutes. Operating from 5.00 to 21.00. Ticket price is 30 000 VND( 1.5 USD). There are many more, however, this is also enough to use for your transportation. -Electric cars: They run along the tourist routes in the Hanoi old quarter and French quarter This is a new type of sightseeing transportation in the recent years and a lot of tourists use it. It is really good for our environment, no pollution because they use electric to operate. They run around the Hanoi old quarter and the French quarter with a good frequency and low fares. Their routes in the old quarter is about 6.5km. passing 28 commercial streets, 13 traditional handicraft streets, 22 communal houses, 9 temples, 3 pagodas and 8 historical sites, Hoan Kiem Lake and Dong Xuan market. Schedule: Hoan Kiem Lake – Hang Bong street – Le Duan Street – Tran Hung Dao – Quan Su – Ly Thuong Kiet – Hai Ba Trung – Opera House – Hoan Kiem Lake. And another route: Hoan Kiem Lake – Ma May – Hang Bac – Hang Bo - Hang Hom – Hang Trong – Hoan Kiem Lake. The ticket is 15 000 VND for 30 minute electric car around the city. -2floor bus Hop on – Hop off: This is a new type of sightseeing transportation. The bus is with 2 floors, it will bring to tourist a good view to Hanoi city. 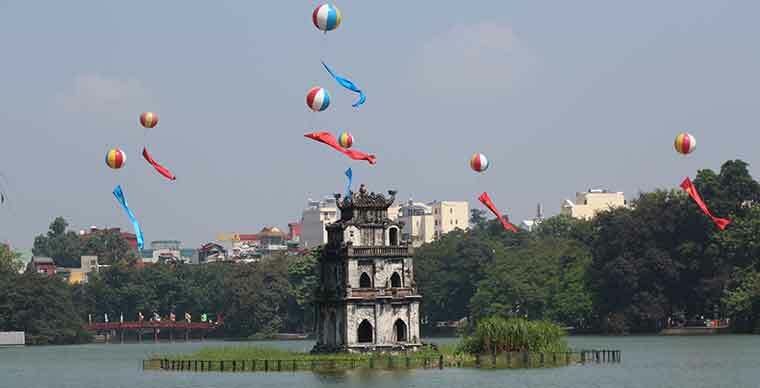 The bus starts from Hoan Kiem Lake and having 13 bus stops corresponding to 13 tourist attractions in Hanoi. You can get on and get off any time of the day at these bus stops. 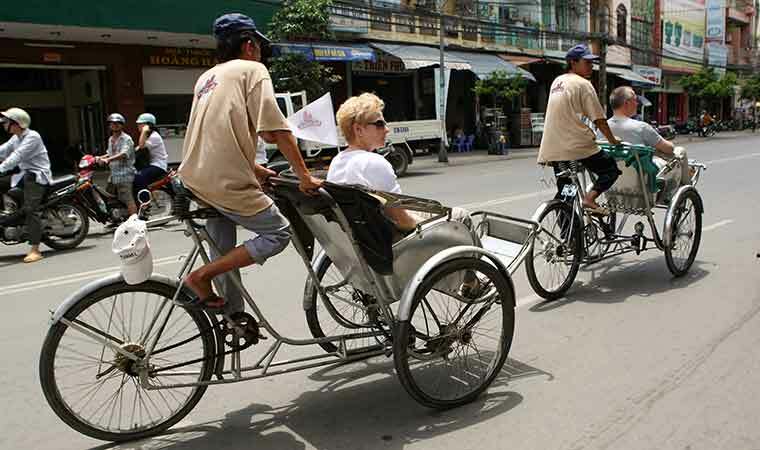 Tourists will travel on Hop on – Hop off from Dong King Nghia Thuc Square-Hoan Kiem. Lake then to Joseph’s cathedral, Flag tower of Hanoi, Ho Chi Minh Mausoleum, Quan Thanh Temple, Tran Quoc Pagoda, Cua Bac Church, The imperial citadel of Thang Long, The temple of Literature, Hoa Lo prison relic, Vietnamese women museum, Hanoi Opera House, Hanoi post office – and back to the starting point. You can hail or be offered by cyclists anywhere in the city. The dealing price is about 100 000 VND/per person/hour. You could customize your routes or recommended by cyclist. They could speak some English. -Motorbike taxi: This is a motorbike vehicle, the motorbike is with the range of 100 – 125cc, you can schedule a ride in Hanoi city and hire a motorbike taxi and the dealing price will not exceed 1 000 000 VND/day or you ask motorbike taxi take you from place to place with price is about 7 000 VND/km. Minimum for first km is 20 000 VND. -Grab application on smartphone and book a car or motorbike. The fee will be shown to you before you decide to book. It is very convenient and clear. Just download the app and need 3G internet to use the app. -Motorbike Rental: we do not encourage you to use this type of transportation because it requires you to know how to drive in Vietnam where the traffic is very messy. However, if you have driving license, this type of transportation is very attractive and new for visitors. You can ask the hotel to rent for you a motorbike, preferably a scooter for easier control, The fare is about 200 000 VND/day. You fill up the gasoline and travel anywhere in Hanoi city. You will have to check the condition of the motorbike before receiving the vehicle and test all the functions such as horn, brake, lights… to ensure they work perfectly. -Walking: This sounds funny. 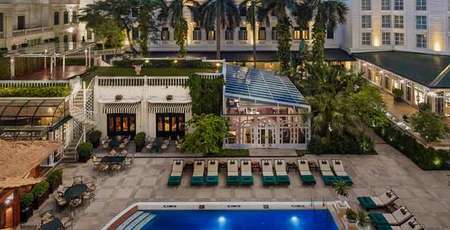 However, this is the very good way to discover deeply inside Hanoi. If you are walking lovers and your hotel are in the city center, you can do that. All that you need is a smartphone with GPS map or simply a map, good walking shoes, sunglasses and hat, a bottle of water. Then let’s go. 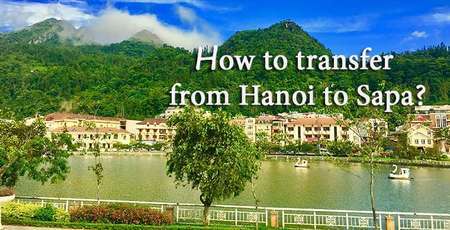 Traveling in Hanoi city is easy if you have some kind of transportations information. It will help you more convenient and self-confident to travel around and discover this beautiful city which named the city of peace.